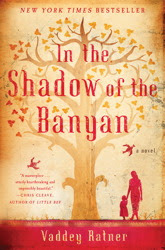 I was first drawn to In The Shadow of the Banyan due to it's colourful yet simple cover. It's exactly the type of art that I love and yes, I often am drawn to books by the cover even though I know it's not always a great way to select something to read. But In the Shadow of the Banyan did not disappoint. It was a difficult book to read at times due to the subject matter and especially since it seems like a lot of books with difficult topics have come out these past months. The author definitely was able to portray this story with heartbreaking grace. It was definitely a book that will stick in your heart and mind after you've read it and judging by others' opinions, this is a common reaction to this family's tale. It's astounding to me the strength that this author must have as a person in order for her to have been able to write a story based on her personal and very difficult, even horrific experiences. And as a first time author too! Her prose and descriptions are absolutely fantastic - it almost feels like you are right there, of course without having to experience the awfulness firsthand. I think it's a credit to her courage that she was able to tell this story and also be so incredibly descriptive that this story really came to life. I'm very grateful for the chance to hear this story and to share in her experiences and I learned about something that I'd previously had no knowledge of. Despite the fact that this was a very heartbreaking book, it also showed the power of hope and human resilience. I'd say that In the Shadow of a Banyan is a must read. Thank you to Simon and Schuster for our review copy! All opinions are our own.